In China, a “Legal Education Center,” informally known as a “brainwashing class,” is a form of black jail. It is used to imprison innocent citizens without any legal procedure. It is “non-judicial imprisonment” and “arbitrary detention” strictly prohibited by the United Nations’ human rights treaties. It also violates China’s own Criminal Law and Criminal Procedural Law. On a scale of worse to the worst, torture occurs far more frequently and cruelly in detention centers than in jails, and labor camps were still worse, but the so-called legal education centers are the worst of all. The number of innocent citizens tortured to death in these centers across China is in four figures. 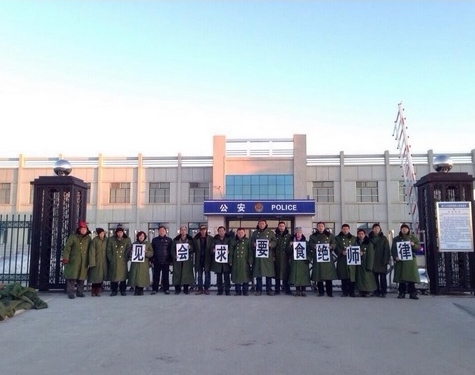 Activists shouting “Good Morning” to the four detained lawyers. For example, the “Legal Training Center” in Chenggu county, Shaan’xi (陕西省城固县) is a closed-off site that has been detaining petitioners without any legal authorization. Xu Lingjun (胥灵军), a disabled veteran and petitioner, had been detained here for a long period. He died of starvation on March 17th, 2010, in the center. An autopsy found no food in his stomach except for two small pieces of ice, the size of a coin. Another example, the “Hubei Provincial Legal Education Institute” is located in Mahu village, Hongshan District of the provincial capital of Wuhan (武汉洪山区马湖村). Wang Yujie (王玉洁), a then 24-year-old woman, was arrested and detained there on March 11th, 2011. She was given an injection of poison and then forced to write a statement denouncing her faith. Wang Yujie could not walk after the injection and endured great pain. She was detained there for two months and died four months later after she was released and returned home. In another example, 45-year-old Chinese citizen Yuan Pingjun (袁平均) lived in the telecommunication bureau’s dormitory on Gexin street in Xinhua District, Shijiazhuang municipality. He was forced into a “brainwashing class” of a legal education center on August 2nd, 2010 and died there nine days later on the 11th. The four lawyers have been to these centers in Heilongjiang, Sichuan and other provinces, at the requests of family members, to intervene in cases of arbitrary detention and to file complaints against this illegal practice. This trip is their third to Jiansanjiang, near China’s borders with Russia, to expose the crimes of the black jail there and to free a few Falungong practitioners. Zhang Shoufen (张守芬) was a local case. She was put in a labor camp for two years for practicing Falungong when she was employed by No. 3 Middle School of Qixing Farm. On October 16th, 2009, she was kidnapped at the Jiansanjiang train station and brought to “Jiangsanjiang Legal Education and Training Center” where she was cruelly tortured. On November 17th relatives who were summoned to come to get her found that she had become mentally ill as a result of torture. “Legal Education Centers” in China are not about law nor education. Instead, they are black jails that arbitrarily detain innocent citizens, such as believers and petitioners. Its “brainwash class” could last from fifteen days to two months, and in some cases, several years. Arrest, detention and beating were perpetrated without any warrant, trial, term limit, oversight, or accountability. “Legal Education Centers” blossom everywhere across China. For instance, in Heilongjiang Province alone, a partial tally found brainwashing classes in Wuchang (五常), Qinglongshan (青龙山) in Jiansanjiang, Liulu in Qitai River (七台河六吕). The Politics and Law Committee in Mishan city (密山市) hosts a brainwashing class, so does the residential building across the street from Xinxing Square in Shuangyashan city (双鸭山市). They exist in the cities of Haerbin (哈尔滨), Jixi (鸡西), Daqing (大庆), Mudanjiang (牡丹江), Qiqihaer (齐齐哈尔), Hegang (鹤岗), Yichun (宜春), etc. Activists in front of the Legal Education Base, demanding four lawyers’ right to counsel be respected. According to statistics, more than 3,000 deaths across China have been directly or indirectly attributed to torture in these legal education centers over the years. The provinces where most deaths occurred are Heilongjiang (黑龙江), Hebei (河北), Liaoning (辽宁), Jilin (吉林), Shandong (山东), Sichuan (四川) and Hubei (湖北). Heilongjiang is No. 1. Little wonder that the local Jiansanjiang government is scared of human rights lawyers and the truth. A recent study investigated 329 districts or counties in 173 municipalities and found 449 of these legal education centers that are named variously Legal Education School, Legal Education Training Center, Education and Transformation Class. Some even name themselves “Caring Education Centers.” These illegal facilities are mostly rampant in Shandong, Hebei, Sichuan, Hubei, and provinces in Northeast. The study recorded 365 cases of citizens being tortured to death in these black jails. Reeducaion-through-labor camps were abolished across China in the second half of 2013. However, the number of brainwashing classes has been on the rise in many cities and provinces. According to incomplete statistics, in the second half of 2013, 1044 Chinese citizens were kidnapped and put into these classes, six times of the number recorded in the first half of 2013. Rights lawyer Wu Lei (伍雷), who was among the many lawyers and citizens in the past two weeks who converged in Jiansanjiang to protest the detention of his colleagues, randomly sampled a few local residents about the Legal Education Center. The locals know about it, loathe it and fear it. By China Change in Reports, Rule of Law on April 3, 2014 . The Communist Party regime’s “Legal education centers” are actually brainwashing detention centers.